Has anyone ever told you you were anything less than beautiful? 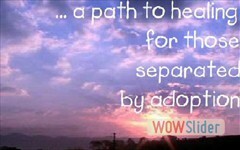 Where understanding, acceptance and empowerment happen for those separated by adoption. 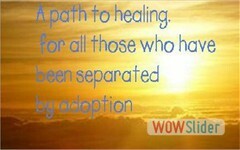 Two days of healing with adoptees and mothers who have lost children to adoption. These healing weekends, for adoptees and mothers who lost children to adoption, are a carefully developed progression of exercises which lead people to feel safe, enhance visualization techniques leading to inner child work, exploring the ability to experience the feelings that are so scary, and combining these exercises to do some deep healing and learning ways to help themselves come to inner peace contentment and freedom to live authentic lives. ** price is for weekends in Congers only. ** $25 will be donated to Covenant House New York's Mother/Child program from each $200 fee. to the inner child work of my books! 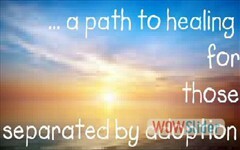 Click here to read what a mom had to say about her healing weekend! Israel, Italy, New Zealand, Norway, South Africa, Switzerland, Vienna and the Virgin Islands. *** Reunited pairs are welcome at all weekends. Location: Congers, NY (1/2 hour north of NYC) unless otherwise noted. "Not to have knowledge of what happened before you were born is to be condemned to live forever as a child." 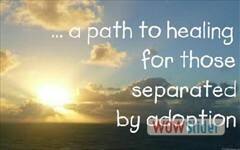 - Cicero (c. 106-43 BC)"
ï¿½ Copyright, 2015, Adoption Healing, Inc.